Heat oven to 400°F. Spray bottom of 13x9-inch (3-quart) baking dish with cooking spray. Place potatoes, onion and carrots in baking dish; toss with half each of the oil, garlic, thyme, tarragon, salt and pepper. Bake 10 minutes. Meanwhile, in medium bowl, toss bell pepper and zucchini with remaining oil and seasonings. Stir into mixture in baking dish. 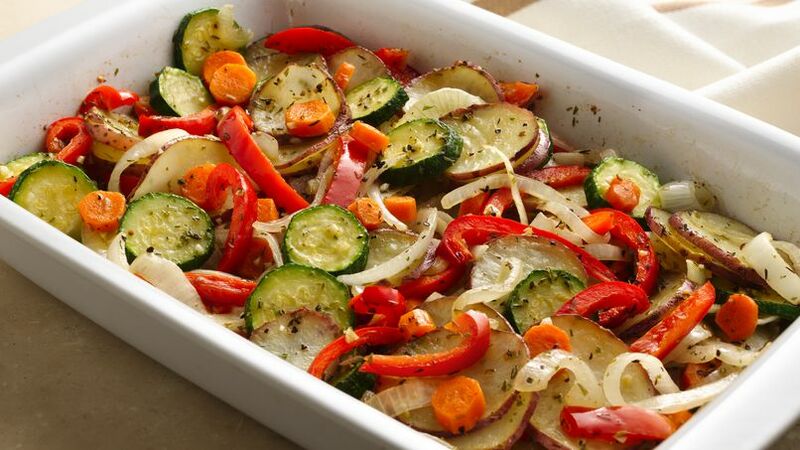 Bake 30 to 35 minutes longer or until vegetables are tender; stirring halfway through bake time. This recipe would go great with grilled steak or chicken.